At the end of each year, we’re running a customer satisfaction survey and whether our users work in an SEO agency or are responsible for generating more traffic for their company’s website, they all have one thing in common: SEOs are extremely busy people. So that’s why we thought we could give you guys a hand on saving some precious time by showing you how to put AWR Cloud into the “set it and forget it” mode. This way, you’ll have more time to focus on the optimization work itself. Therefore, you have the power to choose how frequent the rankings are delivered. 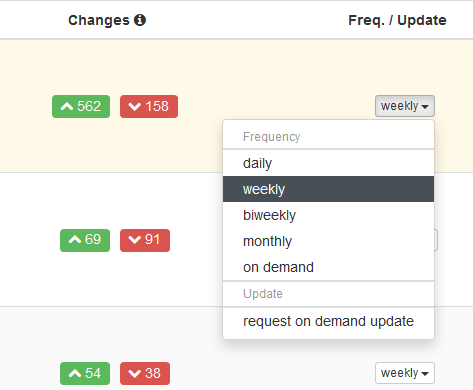 The default update frequency is set to “weekly” and as long as you don’t select the “on-demand” option and start the rankings retrieval process, the rankings will be automatically gathered. Switching from an update frequency to a different one will affect the number of resources consumed by the application, but I will not go into detail on how it’s best to configure your account, as we already covered this topic in another article. 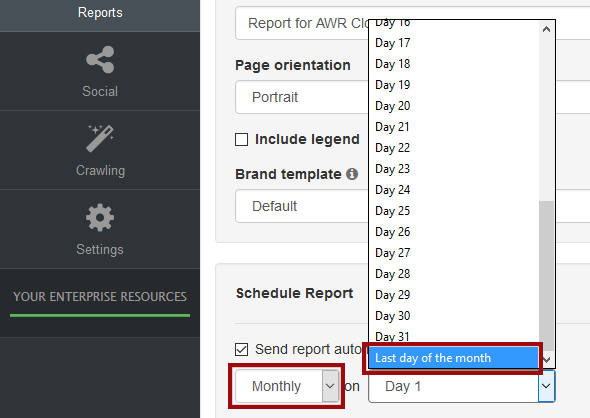 Daily or bi-weekly reports are usually less commonly used, but you’ve got these options, too. 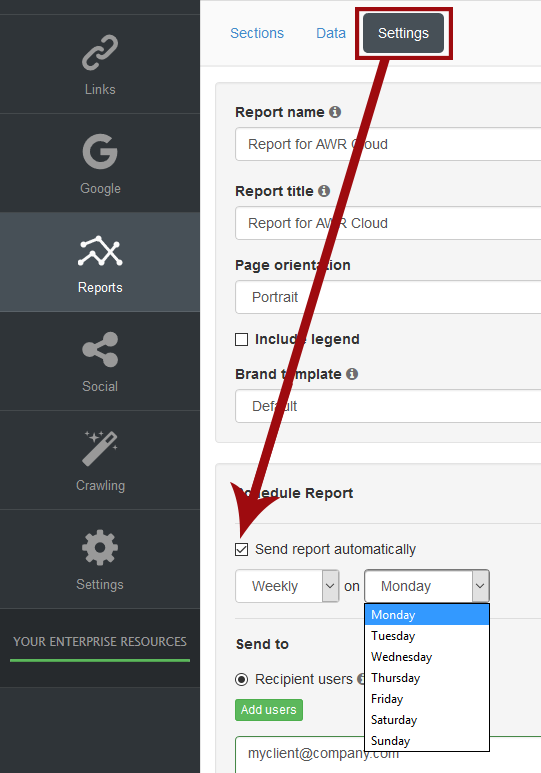 If you’ve already granted your clients access to their assigned projects within your AWR Cloud account, you can select them from a list in the “Recipient users” field. Otherwise, you can type down their addresses, separated by comma, in the “Email” field. 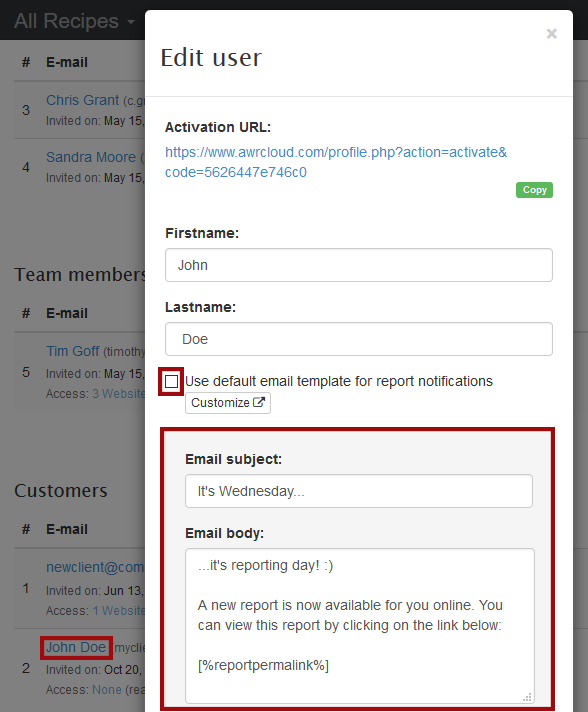 The nice part about having users already invited to your account is that you can customize the message each of them receives when getting the report. You can tell the guys from the eCommerce website you’re doing SEO for that their Wednesday report is ready or the flower shop next door that the monthly rankings have been delivered to their inbox. Usually, rankings only change a few positions from one update to another, depending on the search engines algorithms, the data centers where the results are retrieved from etc. What if I told you there’s an option which allows you to get notifications only for changes that are relevant to your campaigns? You can do this across all your projects by selecting the changes threshold value within AWR Cloud. In other words, you’ll get notified about situations that really require your attention and actual decision-making. 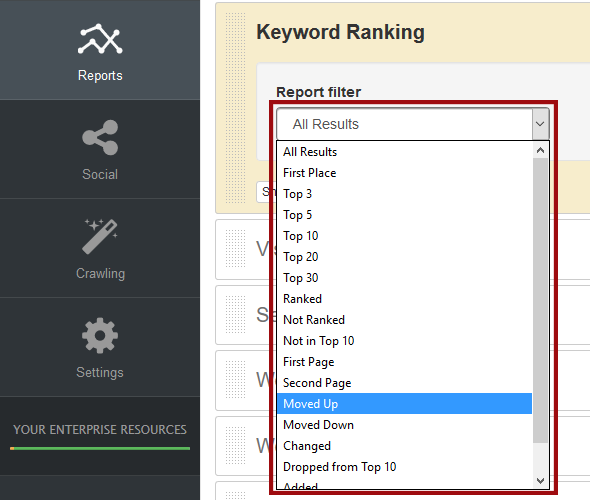 For instance, you can set a change threshold for keywords moving up or down 4 positions. That way you won’t get bugged by emails with data on projects with tons of keywords whose rankings fluctuate very little. It’s just another automatic setting that can help you focus on what’s really important. Pretty cool, right? To set the notifications to be sent into your inbox only for the websites whose rankings change with at least “X” positions, go to Settings – Account settings and change the value in the “Changes threshold” field. 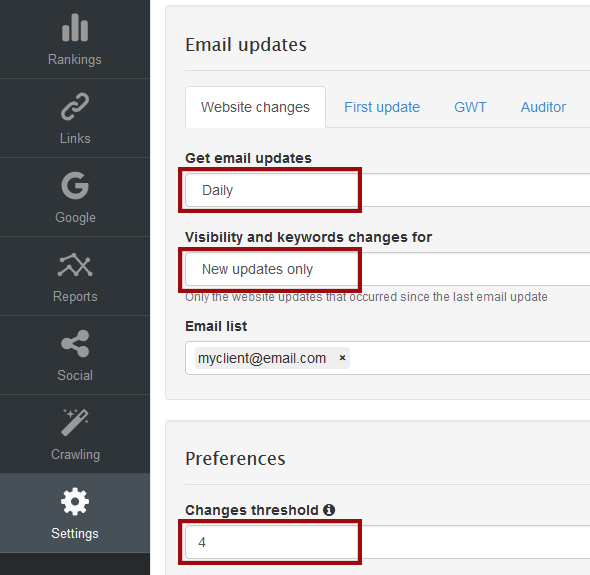 Also make sure you select between the daily and weekly frequency for these emails and the “New updates only” option from the “Visibility and keywords changes for” drop-down that will appear. Discovering the underperforming and overperforming keywords in a sea of rankings might seem overwhelming sometimes. And since you’ve learned how to get info only about the projects where the rankings changed with a given number of position, it’s time to find out how to zoom-in and focus your attention at a keyword level on a certain project. In other words, get notifications only for the keywords that dropped from top 10, rank higher and so on within a certain project. I suggest creating different reports for good news (containing keywords that rank higher) and bad news (containing the keywords for which your website no longer ranks). 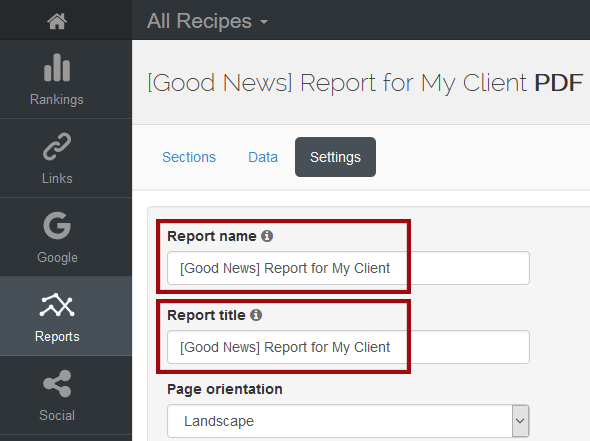 For the sake of this example I’ll show you how to do such a report, but you can apply any of the filters that interests you most. Then follow the same steps above, but use a different filter (a “negative” one this time) and a different report name for the “bad news” report. The idea of setting AWR Cloud on autopilot is to save time. And while this begins into your Cloud account, it continues afterwards, as well. As part of an SEO agency or large multinational brand, you may already be familiar with some in-house client programs well integrated into your workflow. Syncing the rank tracking app with your customized system can be crucial from a time management perspective: the compatibility between the two, the time invested to learn the first app and onboarding your colleagues, impact on the workflow and so on. That’s why learning how to manage your projects programmatically through the AWR Cloud developer API can make a significant difference to your SEO workflow efficiency. When in doubt, check our online documentation on this topic or contact our support team directly – they’ll be more than happy to answer your questions and suggestions!